Norwegian Air and UNICEF will send an aircraft fully loaded with emergency aid and school supplies from Oslo, Norway to Amman, Jordan in November to help Syrian children living in refugee camps. Through this initiative, Norwegian and UNICEF will help the more than two million children affected by the brutal civil war in Syria. Norwegian’s CEO, Bjørn Kjos, will also be on the flight to assist. Norwegian won two prestigious Passenger Choice Awards at the renowned APEX Awards Ceremony this evening at the annual ceremony which took place at the APEX EXPO in Portland, OR. The airline won the categories Best in Region: Europe and Best Inflight Publication, for n Magazine. 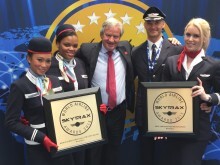 It was the second year in a row Norwegian was named Best in Region: Europe by passengers. 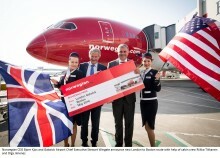 Norwegian has been named Europe’s Leading Low-Cost Airline 2015 by the renowned World Travel Awards, one of the travel industry's most prestigious awards program, rewarding leaders in the travel sector around the globe. In 2014, over 650,000 individual votes were cast by travel professionals and high-end tourism consumers. Norwegian has signed an agreement to acquire an additional two new Boeing 787-9 Dreamliners, enabling the company to launch even more long-haul routes. Both aircraft are scheduled to enter service in summer 2017. The 787-9 is larger than the eight 787-8s that Norwegian currently operates on its long-haul routes. With this new agreement, the long-haul fleet will consist of 19 Dreamliners by 2018. 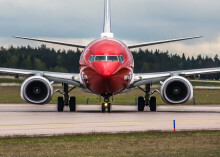 Norwegian announced it is launching direct service from Boston Logan International Airport (BOS) to Copenhagen, Denmark (CPH) and Oslo, Norway (OSL), beginning May 2016. Last month the airline also announced it would start nonstop service to London’s Gatwick Airport (LGW) in May 2016. Flights to Oslo will be twice weekly and to Copenhagen once weekly. Norwegian Air extended its partnership with UNICEF by launching a new function that allows passengers to donate funds when purchasing their flights online - within six weeks of launch, $65,000 has already been donated to UNICEF, more than half a million Norwegian kroner. 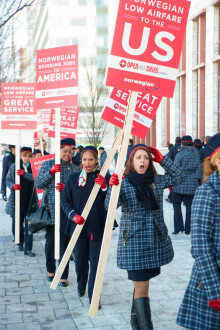 Norwegian carried 2.1 million passengers in April 2015, an increase of seven percent compared to the same month previous year. The load factor was 82.4 percent, up 2.6 percentage points. 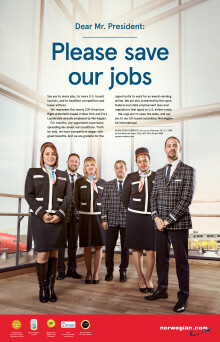 Norwegian today reported its first quarter results for 2015. The net profit is -538 MNOK, an improvement of 57 MNOK from the previous year. The quarterly results were affected by the pilot strike in Scandinavia and the weak Norwegian currency (NOK). The passenger growth outside Scandinavia is strong and the load factor is six percentage points higher than the same period last year. 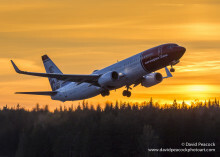 Norwegian continues to expand its long-haul network with new direct routes. 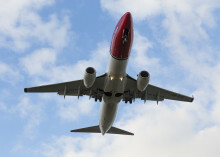 Starting November 2015, Norwegian will launch a non-stop service from Las Vegas to Stockholm and Copenhagen, as well as flights from the Caribbean island of Puerto Rico to Stockholm, Copenhagen, Oslo and London. Norwegian will also offer flights between the largest of the U.S. Virgin Islands, St. Croix, and Copenhagen. On Monday evening, Norwegian’s first flight between Orlando and Copenhagen took off from Orlando International Airport (MCO) in Florida. On Saturday April 4th, meanwhile, Norwegian’s first flight between Orlando and London is due to take off.